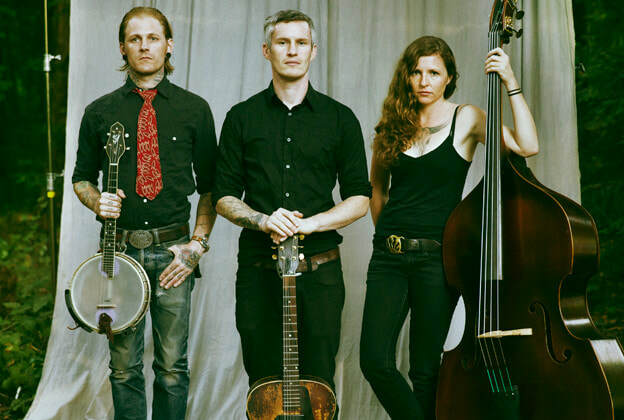 Critically-acclaimed, billboard-topping Americana/Bluegrass trio The Devil Makes Three will be kicking off their much-anticipated Spring 2019 Tour on April 16 and performing in the UK from April 21-26.
this highly-anticipated international tour will hit the U.K., Germany and The Netherlands to perform with Dropkick Murphys before heading to the States May 10. The Devil Makes Three’s journey could be deemed worthy of a novel. Their self-titled 2002 debut album yielded the classic “Old Number Seven,” “Graveyard,” “The Plank,” and more as they organically attracted a diehard following through constant touring. Longjohns, Boots and a Belt arrived in 2003, followed by 2009’s Do Wrong Write. 2013’s I’m a Stranger Here marked their first appearance on the Billboard Top 200. 2016’s Redemption & Ruin heralded the group’s second #1 bow on the Billboard Top Bluegrass Albums Chart, and fourth consecutive top-five debut on the respective chart. The latter garnered widespread acclaim from the likes of Entertainment Weekly, American Songwriter, The Boston Globe and more. Over the years, they’ve cast an unbreakable spell on audiences everywhere from Lollapalooza and Bonnaroo to Hardly Strictly Bluegrass, Hangout Fest and Shaky Knees.